The CNO Financial Indianapolis Monumental Marathon, Half Marathon, 5k and Kids Fun Run is a huge goal for many people on a weight loss journey which makes them a perfect partners for FitBloggin & FitSocial.. Every year, they hear stories of transformation, dedication, and incredible achievement. Amanda Brooks is one of those stories worth sharing and tell us the ups and downs of her journey below. We’ve all seen those same magazine articles that tout the next quick fix to be your best self, lose those last 10 pounds, run a PR, the list goes on. This blog is not that. My name is Amanda and I’m a runner. It’s always strange to identify myself that way because I don’t look like your stereotypical runner (though what does she look like anyway?!) and I don’t think I’m particularly good at running. I’ve completed five half marathons and plan to participate in my third Monumental Half this November, but I reluctantly call myself a runner as reluctantly as I used to lace up my shoes and run. As a college volleyball player, I DREADED our preseason midnight runs. We had to run for 20 minutes straight and I would walk when our coach wasn’t looking. I started running more frequently in grad school as a way to relieve stress. In a career where I can work upwards of 80 hours a week, I wanted to do something that forced me to take time for myself, no matter where I was in the world. Running was the perfect fit. I would cruise through college campuses, sprint on football stadium steps and took running as a way to connect with wherever I traveled. It centered me. Well, that and coffee. And then a few years ago, I found myself at 223 pounds. I had just moved for a new job five months prior and was struggling in a very serious way. I was out of my comfort zone and couldn’t get settled. It was a struggle to get out of bed every day. Battling eating disorders for the better part of the last two decades, I relapsed within two months of moving and started sinking fast. I stopped working out entirely because the effort it took to make it through the day was enough to deal with. 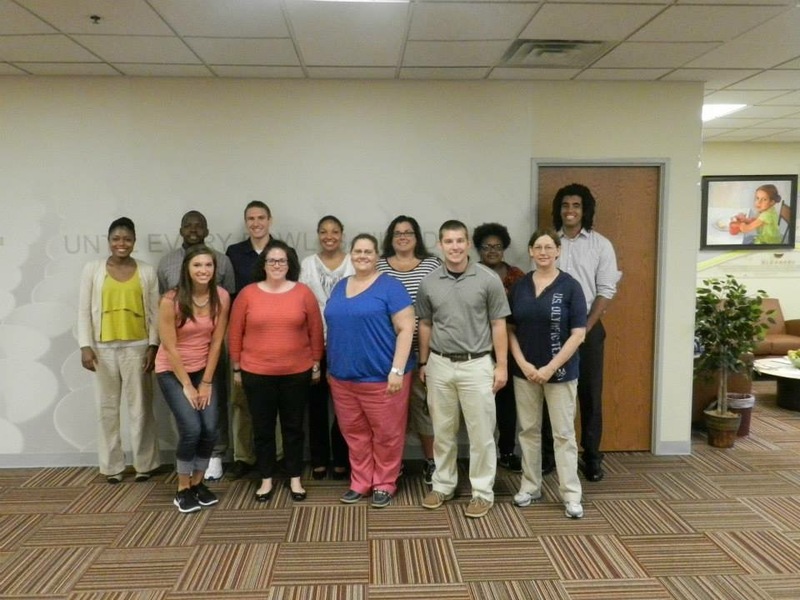 In June of 2014, my office took a volunteer trip to Gleaners and had our picture taken before our shift. I was horrified to see the photo (I’m the one up front in pink). What had I done to myself? I tearfully called my twin sister and unraveled. I had so artfully ignored how I looked and felt physically because I was blinded by how I felt mentally. That photo changed everything. 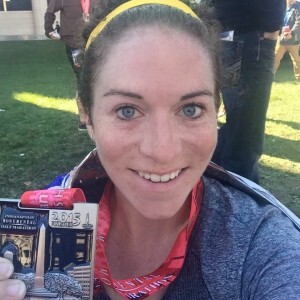 Put one foot in front of the other – Running helped me find myself years earlier and it’s what I turned to when I had 223 looking me in the face…except I couldn’t run around the block without keeling over. So I would take 30 minutes each day to run for 1 minute, walk 14 minutes and repeat. Each week, I’d change the ratio by a minute until I was running for 30 minutes straight. Another trick I had was parking my car on the opposite side of the lot or finding a spot on top of the garage. Any way I could get extra steps, I would. Now, I eat lunch at my desk and take that time to walk around downtown with one of my girlfriends. It separates the day and gets me outside. Mix it up – About three months into my weight loss journey (I seriously dislike that word because there’s no destination when it comes to taking care of yourself, but I’ll use it for this), another girlfriend convinced me to try spinning. I hadn’t taken a spin class since grad school and was unsure I’d like it, but tried anyway. I was HOOKED. She introduced me to a studio up in Carmel called InCycle, which has a great community atmosphere and was exactly what I needed to change things up. When I need alone time, I run, and when I feel like I need support, I go to spin class. I find that I don’t get bored as easily if I change things up. Balance is real– I knew I would never be able to lose this much weight and keep it off if I heavily restricted myself. I planned out my meals every week and saved room each day for a small treat. By planning ahead and making that treat part of my daily routine, I was able to eliminate the guilt I previously felt if I had a drink with dinner or a handful of M&Ms. I was just enjoying my life, which was something I hadn’t done in a while. Celebrate the small victories – This was a very tough principle for me, because I was too busy punishing myself for getting to 223 in the first place. NOT healthy. I broke the weight I wanted to lose into manageable five-pound sections. Every five pounds I lost, I would do something for myself. I’ve never been someone who runs a race and then goes ham (and cheese) afterward. So instead of splurging, I would go on a walk on the Monon with no headphones, paint my nails, anything that forced me to spend time with ME. I also rely on my family for support and accountability. We’ve had a fitness group message going on Facebook for the last couple years. It keeps us all accountable while also letting us celebrate our victories and pick each other up when we need it. Find your inspiration where you can and be kind to yourself. All of this boils down to something simple: you’re worth spending time on. I’ve always been so focused on my career and taking care of those around me that I never learned how to truly take care of myself. I would sacrifice basic needs (sleep, food, exercise) just to be the best for everyone else. Running has given me the tools to take care of myself mentally and physically, and races like the Monumental Marathon are great for setting goals and achieving them while taking steps to being a better you for you. Are you ready to try something new for yourself? Consider registering for your Monumental Journey today!